Bryant.edu does not passively collect personal information about you. The information we collect includes the domain name from which you access the Internet, the IP address of your computer, the date and time you access our site, and the Internet address of the web site from which you linked to our site. We use this information to determine traffic to the various sections of our site and to help us make the site more useful. Unless specifically stated otherwise, no additional information will be collected about you. Inquiries that are e-mailed to us are stored, including the question and the e-mail address information so that we can respond. We will not collect any information that will allow us to personally identify you when you visit our site, unless you choose to offer such information. The email function on Bryant.edu is not a secure communication link. Your email may be seen by other Internet users while in transit to us, so do not email us if you wish to keep your message confidential. 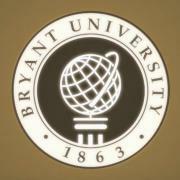 While visiting sites within the Bryant.edu domain, you may encounter a Web page that uses “cookies.” A cookie is a small data file that a Web site transfers to your computer’s hard disk that allows a server to recall information about your session while you’re connected. Cookies that come from Bryant.edu Web pages are not designed to collect personal information about you, only about your browser session. The cookie makes it easier for you to use some of the features of these Web pages. The cookie and the information about your session will be destroyed automatically shortly after you close your browser. It is not permanently stored on your computer. Unless a Bryant.edu Web page specifically notifies you, we will not collect personal information about you. We use third-party advertising companies to serve ads when you visit our Website. These companies may use information (not including your name, address, email address, or telephone number) about your visits to this and other Web sites in order to provide advertisements about goods and services of interest to you. To learn more about this “behavioral advertising” practice or to opt-out of this use of your anonymous information, you can visit www.networkadvertising.org . Bryant.edu contains links to Web sites operated by third parties. Bryant.edu has no control over the policies of third party sites. Be sure to review the terms of those sites for their practices.